The fourth ie show in Chicago (my 83rd overall) saw the debut of “The Crystal Ballroom” – finally! 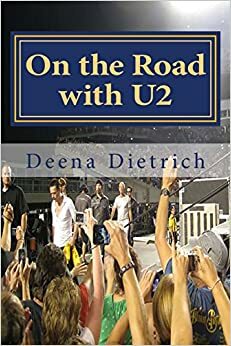 Chicago4 was also the first show on the ie tour that did not have a fan on stage filming on Meerkat – and Bono did not pull anyone up during “Mysterious Ways.” I again did not take one picture during the show – I just took it all in, very freeing. I woke up around 8:30am on the morning of the fourth Chicago show after only about four hours sleep after Chicago3. I was exhausted and my knee was stiff (torn meniscus), so I spent the morning icing it down. Then I ordered a pizza from Giordano’s, so I could have it for after the concert and the rest of the week. Out of the three Chicago pizzas I have tried Uno’s, Lou Malnati’s and Giordano’s, I like Lou Malnati’s the best for overall flavor, but Giordano’s is the cheesiest (not a fan of Uno’s). I arrived at the United Center just before 1 to wait for U2 to arrive. I got my spot in the shade under a tree against the fence – the same place I waited the day before. I couldn’t be up front on the barricade, so I figured I might as well be comfortable. Edge arrived around 2:30ish. He drove all the way into the garage, then about 15-20 minutes later he walked back out to greet everyone – no autographs or posed photos, just hand shakes. Like last week, he again climbed up the hill and greeted all the fans waiting behind the fence. Larry arrived around 3ish and shook hands with everyone. He didn’t pose for photos, so I didn’t miss my chance by being in the back. Larry called up to the fans waiting behind the fence asking, “Are you doing ok?” I was shocked he called out to everyone. Adam arrived a few minutes later and just quickly shook hand with everyone. Bono drive on shortly after and just waved from the car. Anisha and I went to the will call booth to get our ga tickets printed, so we didn’t have a problem like the previous night. We got in the Ride line around 4pm. At 5pm, they let us inside. 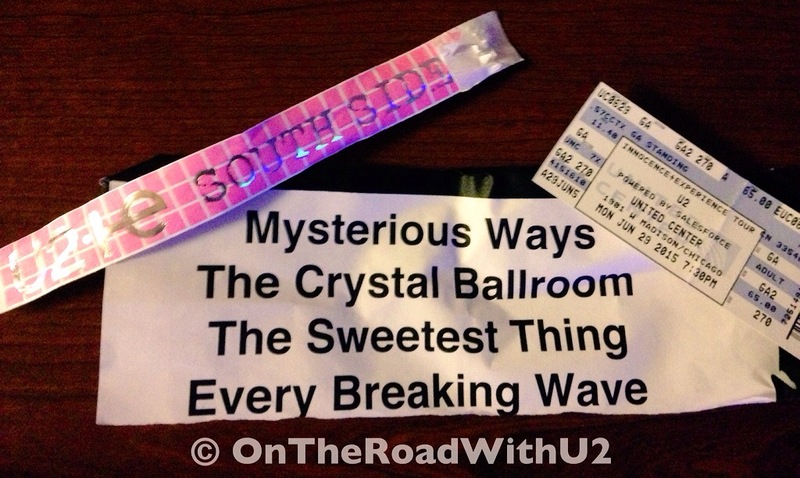 As we entered the building, we heard U2 sound checking “Two Hearts Beat As One.” Then we heard “Sweetest Thing.” I got a huge strawberry ice cream cone, which was just delicious and hit the spot. Think it was the first time I ever ate in the GA. Bono and Edge sound checked the Stevie Wonder version of “Happy Birthday,” which we thought was very random. We were let onto the floor the same time as the GA and got a great spot on the rail at the back of the e stage, behind Larry’s drums, in front of the steps where Bono enters – the same spot where I stood opening night in Vancouver. I don’t need a spot on the rail, but if I can get it without waiting in line all day, I’ll take it and when I get it I don’t want to lose it. I love that spot – it is very close to Larry, it has a much better view of the main stage and it’s less crowded and pushy behind us. But I also like to stand a little further around the e stage toward the front, so I can actually see Larry drumming, but then the view to the main stage is not that good. It’s a toss up. Bono forgot the “my hands are tied verse” during “With or Without You,” which for some reason really bothered me – not bothered as much as surprised me. Bono led the audience in singing “Happy Birthday” to John Cusack, just as he did back on 360 in Chicago on July 5, 2011 when I was standing right in front of him behind the stage. At the end of “City of Blinding Lights,” security moved people from the back so I knew U2 would be closing with “I Still Haven’t Found What I’m Looking For” and leaving from the e stage. Unfortunately, they left down the other steps rather than the ones in front of us. But I do love a U2 show better when “I Still Haven’t Found What I’m Looking For” is included. And unlike most other fans, I enjoy it as a closer. It leaves me with hope, and I like leaving the concert with a feeling of hope. After the show, Anisha and I started our walk back on Madison and decided to stop at the Beer Bistro to eat. I had a yummy bacon cheeseburger and tater tots. Apparently, tater tots are very big in Chicago. It was very comforting – felt like I was 10 again. We were back to the hotel before 12:30. I iced my knee down, took some ibuprofen and went to sleep. I’m relaxing and recuperating today and tomorrow, so I’ll be completely rested for the fifth and final Chicago ie show on Thursday! Can’t wait to hear “Two Hearts Beat As One” – although I already heard it during the sound check! Please click here to see my pictures from Chicago4. Awesome… I couldn’t go this time around and your stories… make it fun. Sorry you couldn’t go. Glad my blog helps. Thanks for reading!